When Western political commentators speculate on whether Xi Jinping could implement political reform, they are really asking whether or not Xi Jinping can successfully deal with Mao’s legacy and the Chinese Communist Party’s (CCP) legitimacy in the context of a modern, state-capitalist country. This is tricky because Mao’s legacy and the CCP’s legitimacy are inextricably linked—pull on one thread of the “Mao was 70% right and 30% wrong” formula and the entire apparatus could come crashing down. 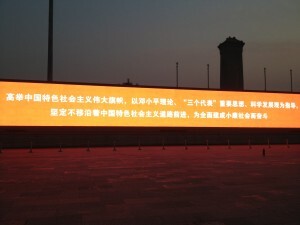 The slogan shown, displayed on Tiananmen Square last November after the CCP’s 18th Party Congress (from a picture I took at the time), takes pains to include the ideas of Deng Xiaoping, Jiang Zemin, and Hu Jintao, but makes no mention of what is supposedly the foundation of the CCP: Maoism, Marxism, and Leninism. Marxism and Leninism have always been in the Party Constitution; Maoism was added in 1945, and taken out only briefly after Stalin’s death when some CCP leaders were afraid of replicating Stalin’s personality cult around Mao. Maoism was added back in after those leaders were purged. But now the CCP can’t be bothered to include these three in a propaganda outlet in one of the most visible spots in the country, right in front of Mao’s Mausoleum. 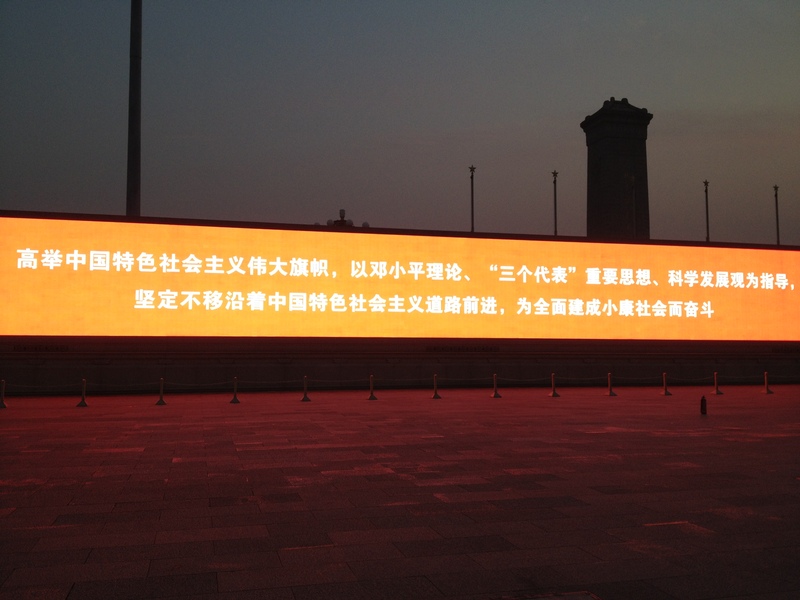 The sign is symbolic of an unsolvable paradox—the CCP is undermined by an ideological platform completely contradicted by its current economic and social systems, but it cannot change its ideology without the party losing its monopoly on power and the cadres losing their wealth and influence. That’s why it’s unlikely the CCP will reform politically until it is inevitably forced to change.